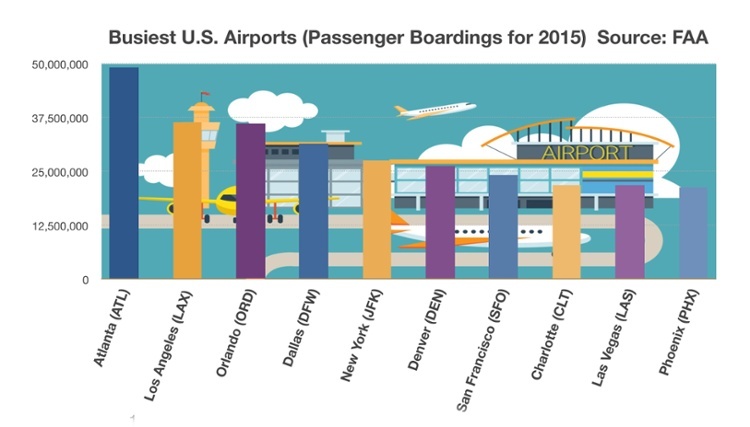 As both business and leisure travel have been increasing domestically and internationally, U.S. airports have seen an increase in passenger traffic. Some U.S. airports serve as international hubs with flights originating in foreign countries worldwide and landing there directly from a foreign destination. With some of the most popular travel destinations in the world, American airports cater to tourists traveling both domestically and internationally. Not only is the Atlanta International Airport the busiest airport in the country, it is also the busiest passenger airport in the world, with Beijing a close second. Atlanta is also geographically attractive, located only a two-hour flight away from 80 percent of the U.S. population. Various factors affect the accessibility of airports and how much traffic they generate. Denver International Airport is located in an extremely rural area of Denver, allowing vast amounts of rail and road traffic access to the airport. Chicago’s O’Hare and New York’s JKF are both situated directly within the city, yet accessible by millions of visitors. Geographic characteristics and access to airports allow some airports to handle more air traffic.